Limb-length discrepancy (LLD) is a common concern for both surgeon and patient in the setting of elective total hip arthroplasty (THA). There is a paucity of evidence guiding surgeons to an optimal method for measuring intraoperative LLD and minimizing postoperative LLD. The primary objective of this prospective, randomized, double-blinded study was to determine which of 3 intraoperative methods used at the authors’ institution was best correlated to postoperative radiographic LLD. From 2011 to 2012, 81 patients undergoing either primary (75) or revision (6) THA with an anterolateral (Watson-Jones) approach were prospectively randomized and received intraoperative measurement of LLD via 1 of 3 methods: abductor shuck (AS), tranosseous pins with calibrated caliper (TP), or patella electrocardiogram (EKG) leads (PL). Intraoperative measurements of LLD were compared to clinical and radiographic postoperative measurements of LLD, and absolute differences and correlation coefficients were calculated for each method. Overall, the mean LLD preoperatively was 8.09 mm, and mean radiographic LLD postoperatively was 4.20 mm. The AS method was associated with the highest correlation to postoperative radiographic LLD (R=0.360; P<.05), whereas the other methods had mildly positive but statistically insignificant correlations (TP R=0.275; P>.05; PL R=0.301; P>.05). The AS method best correlates to postoperative radiographic LLD among the 3 techniques, although all methods were positively correlated. Clinical measurements of LLD correlate poorly with radiographic measurements and may be of limited utility. The authors are from the Department of Orthopedic Surgery, UPMC Hamot Medical Center, Erie, Pennsylvania. Two calibrated sterilizable levels were donated to the hospital by Innomed, Inc prior to this study. The authors thank Tim Cooney for assistance with statistical analysis and Joshua Rosenberg, MD, for radiographic measurements. Correspondence should be addressed to: Ian S. Rice, MD, Department of Orthopedic Surgery, UPMC Hamot Medical Center, 201 State St, Erie, PA 16550 ( riceians@gmail.com). Although preoperative and postoperative LLD are reliably measured with clinical examination and radiographs, intraoperative assessment of LLD is more difficult.12 Surgical approach, patient positioning, and extra equipment (ie, fluoroscopic imaging) can render intraoperative assessment techniques cumbersome or impractical. With modern modular design components, leg length can be adjusted intraoperatively with relative ease.13,14 Conversely, revision surgery to correct symptomatic LLD may be fraught with technical difficulty and complications.15 Therefore, there is a significant potential benefit to accurately assessing intraoperative LLD and reliably correlating to postoperative LLD. Multiple methods to determine intraoperative LLD have been described in the literature. These include, but are not limited to, comparison of soft tissue tension, computer navigation, transosseous pin placement, calibrated levels, direct estimation on the operating room table with radiographs, preoperative templating, and in situ arthroplasty.16–27 Previous literature generally comprises reports of a single technique. One published technique involved inserting a pin below the infracotyloid groove and measuring its distance from a fixed point on the greater trochanter, resulting in an average LLD of 1.9 mm, with no patients requiring a shoe lift.28 Another study of 58 patients used a similar pin-based method with the addition of a bubble level to standardize the positioning of the limb.16 This technique resulted in an average 3.4-mm LLD, with 7% requiring a shoe lift. Although these more recent pin- and caliper-based methods may theoretically offer a more objective, precise measurement of intraoperative LLD, a rigorous comparative analysis of multiple methods is lacking in the literature. Therefore, the primary research objective of this study was to compare the correlation of intraoperative LLD and postoperative radiographic LLD among 3 methods used during THA from an anterolateral approach: a soft tissue comparison method based on the abductor tendinous insertion (AS), a level-caliper system using transosseous periacetabular and femoral pins (TP), and a comparison method based on the relative position of electrocardiogram (EKG) leads placed on the inferior poles of the patellae (PL). The authors hypothesized that the TP method would demonstrate the highest correlation with postoperative radiographic LLD. Two secondary purposes existed for this study: (1) an analysis of the correlation between intraoperative LLD and postoperative clinical LLD; and (2) an analysis of the correlation between clinical and radiographic postoperative LLD. This prospective, randomized, double-blinded single center study included 81 patients undergoing elective primary or revision THA at the authors’ institution by 1 of 5 board-certified orthopedic surgeons, including the senior author (G.J.C.). Enrollment occurred from June 2011 to June 2012. Patients who agreed to participate in the research were enrolled by one of the coauthors. Inclusion criteria included men and women of any age who had failed conservative treatment and elected to undergo primary or revision THA. All patients had persistent pain and functional disability prior to surgery. The study received approval from the authors’ institutional review board. Exclusion criteria included patients undergoing (1) hip hemiarthroplasty, (2) THA for treatment of a femoral neck fracture, or (3) revision THA for septic loosening. Also excluded were patients (4) with an active workers’ compensation claim, (5) with active infection, (6) unable to speak or read English, and (7) unwilling to participate. Mean age was 65.2 years (range, 24–89 years) and 48% (38 of 79) were female. Preoperative diagnoses for primary THA included osteoarthritis/degenerative joint disease (OA; 70%, 57 of 81), femoral head osteonecrosis (AVN; 10%, 8 of 81), posttraumatic arthritis (10%, 8 of 81), developmental dysplasia of the hip (1 of 81), and rheumatoid arthritis (1 of 81) (Table 1). Six of the 81 patients underwent revision THA, with the causes for revision including instability (5%, 4 of 81) and aseptic loosening (2.5%, 2 of 81). A complete evaluation was performed preoperatively, including measurement of LLD from preoperative radiographs and physical examination. For both preoperative and postoperative clinical measurements, the following technique was used: with the patient lying supine on the standard operating table, a tape measure was positioned with one end at the anterior superior iliac spine and the other at the distal tip of the medial malleolus of the ankle. This controlled for apparent leg-length discrepancies. Measurements were taken bilaterally and the difference was recorded relative to the operative extremity. Randomization occurred by selecting a method from a group of identical sealed envelopes containing 1 of 3 assignments: abductor/soft tissue tension (AS), transosseous pins with an Innomed, Inc (Savannah, Georgia) sterilizable level (TP), or EKG leads placed on the patellae (PL). The envelopes were opened preoperatively to ensure availability of the instrumentation if needed. All procedures were performed in the lateral decubitus position, with patients secured with Stulberg hip positioners (Innomed, Inc). A standard anterolateral Watson-Jones approach was used in all cases. With the exception of techniques in intraoperative measurement of LLD, other aspects of the procedure were identical among the 3 groups. Intraoperative measurement of LLD was performed before and after the final acetabular and femoral stem components were placed with the trial femoral head. At those times, measurements were taken according to the randomization assignment. 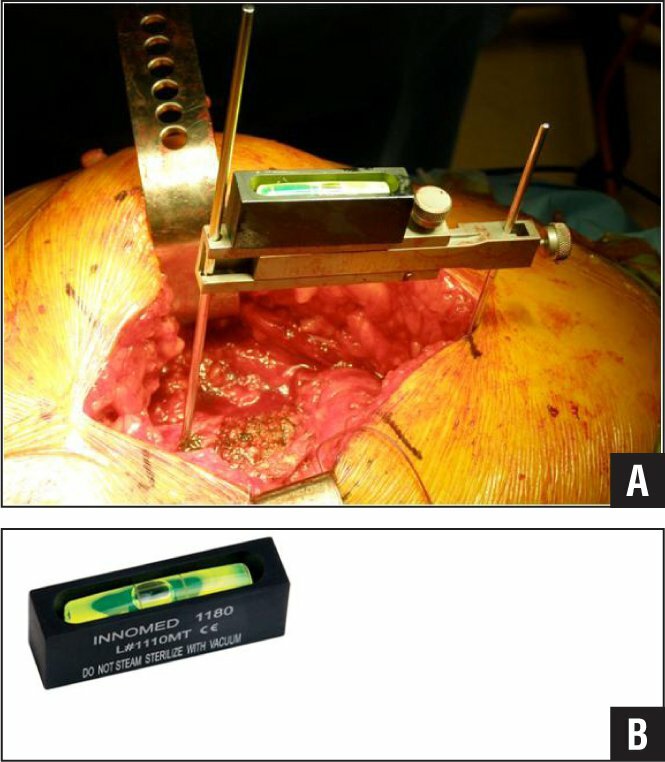 Patients assigned to the AS group were measured accordingly: during the surgical approach, the abductor musculotendinous insertion on the greater trochanter was divided from the bone by electrocautery, and the free limb was then tagged with 0 Polysorb (Covidien, Mansfield, Massachusetts) suture for later repair (Figure 1). The remaining stump of abductor tendon was marked to delineate the insertional footprint of the tendon. Care was taken to note relative flexion and extension of the hip and knee at the time of tenotomy and reproduce the identical position on re-measurement, as this has been deemed critical in previous literature.29 After components were placed, the free limb of the abductor tenotomy was reduced toward the footprint. Relative lengthening of the limb was represented by a quantifiable gap between tenotomy limb edges. Conversely, any overlap in limb edges represented a relative shortening of the extremity by the amount of overlap measured. Intraoperative photograph of the left hip using the abductor shuck method. The bovie electrocautery tip indicates the abductor musculotendinous unit, which is tensioned by a tag suture onto the greater trochanter. The gap (or overlap) between the tenotomized ends of the abductor is measured as the amount of limb lengthening (or shortening). 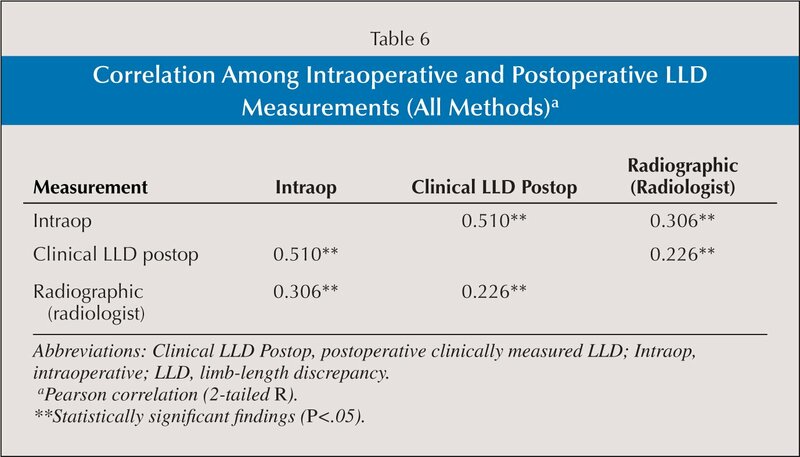 Intraoperative limb-length discrepancy (LLD) is then calculated based on preoperative LLD. Patients randomized to the TP group were measured accordingly: prior to femoral neck osteotomy, 2 parallel transosseous 0.062-inch Kirschner wires were placed—1 in an arbitrary point on the lateral aspect of the femoral greater trochanter, and the other in an arbitrary point on the supracetabular iliac ridge. The calibrated level (Innomed, Inc) was then applied over the pins per the manufacturer instructions, and the length calculated (Figure 2). The pins were removed after measurement and their exact points of insertion were marked with electrocautery. The level theoretically assists in isolating a measurement of longitudinal length and does not incorporate horizontal offset. Once components were placed, the pin-level construct was reapplied to the same points and a new measurement recorded. The difference in measurements was calculated and recorded as the intraoperative change in length, permitting calculation of intraoperative LLD based on preoperative LLD. Intraoperative photograph of the right hip using the transosseous pin method with sterilizable level (A) and close-up of level (B). Two Kirshner wires are inserted parallel to 1 another and perpendicular to the floor, 1 in the greater trochanter and the other in the supra-acetabular ridge of the ilium. The caliper is placed on the pins, and the sterile level placed on the caliper to ensure identical limb positioning with each measurement. Intraoperative limb-length discrepancy (LLD) is calculated by summing the preoperative LLD with the change in length demonstrated by the caliper. Intraoperative measurement of LLD with the PL group included palpation of the bilateral patellae prior to sterile draping and placement of a standard cardiac EKG lead on the inferior pole of each patella (Figure 3). The metallic tip of the lead was carefully aligned at the most inferior point of the patella. After sterile prepping and draping, the metallic tip of the EKG lead could be palpated through sterile drapes on both operative and contralateral extremity. After placement of implants, the relationship of 1 lead to the other in the longitudinal plane was compared by palpation and measured. Unlike the first 2 methods, this method does not require a calculation based on preoperative LLD because the operative limb is directly compared to the nonoperative limb. Preoperative photographs of the patella lead method: front view (A) and side view (B). All patients received identical postoperative treatment. Postoperative clinical LLD was measured and recorded immediately postoperatively in the supine position. Per the protocol of the authors’ institution for all joint arthroplasty patients, a routine anteroposterior (AP) pelvis radiograph was obtained in the postanesthesia care unit, and this was used for postoperative radiographic analysis. Radiographic measurement of LLD was achieved with Seimens MagicWeb software (Siemens, Munich, Germany) using the following technique. A tangential line was used to connect the most inferior edges of the bilateral inferior pubic rami. Perpendicular lines were then drawn from this tangential line to the inferior tip of the lesser trochanter on each extremity, and the difference in the lengths of the latter 2 lines was recorded as the radiographic LLD. This measurement was recorded by a board-certified radiologist blinded to the intraoperative measurement technique and surgeon identity. Similarly, patients were blinded to the intraoperative measurement method they received. An Excel (Microsoft, Redmond, Washington) spreadsheet program was used to collect all data. Statistical analysis was performed using SPSS software (version 10.0; IBM, Chicago, Illinois). A sample size calculation was performed on the basis of differences in correlation coefficient among the 3 groups. A medium (f2=0.15) anticipated effect size (difference in correlation coefficient between groups) was assumed to be clinically significant. The authors also assumed a dropout rate of 0%, resulting in a goal enrollment of 76 total patients. In this study, enrollment was arbitrarily conducted for a 12-month period, resulting in 81 patients total. A total of 99 sealed envelopes containing 33 assignments for each of the 3 subgroups were assembled, shuffled, and placed in a box from which the randomized assignment was pulled in a blinded fashion for each patient. Ninety-nine envelopes were arbitrarily constructed to allow for the possibility of enrollment beyond the goal of 76 patients. This randomization method resulted in a slightly imbalanced allocation among the subgroups (1.5:1:1.3; AS=32, TP=21, PL=28). Correlation coefficients were calculated using Spearman parametric analysis. Differences between intraoperative methods were calculated with analysis of variance (ANOVA). A P value (alpha) of .05 was considered significant. The primary objective of the study, as well as several secondary objectives, revolved around the correlation of 1 measurement with another. Meaningful correlation was identified using the criteria established by Colton, where correlation coefficients of 0 to 0.25 show no to little relationship, 0.25 to 0.50 fair, 0.50 to 0.75 moderate-to-good, and greater than 0.75 good-to-excellent.30 Multivariate logistic regression was performed to determine the association of selected variables (preoperative diagnosis, age) with correlation coefficient. 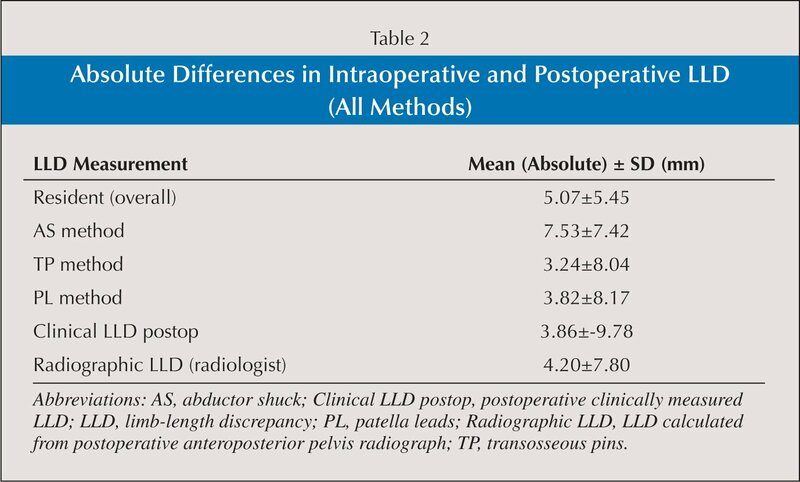 Average absolute differences between intraoperative LLD and postoperative radiographic LLD were 7.53±7.42 mm, 3.24±8.04 mm, and 3.82±8.17 mm for AS, TP, and PL methods, respectively (Table 2). 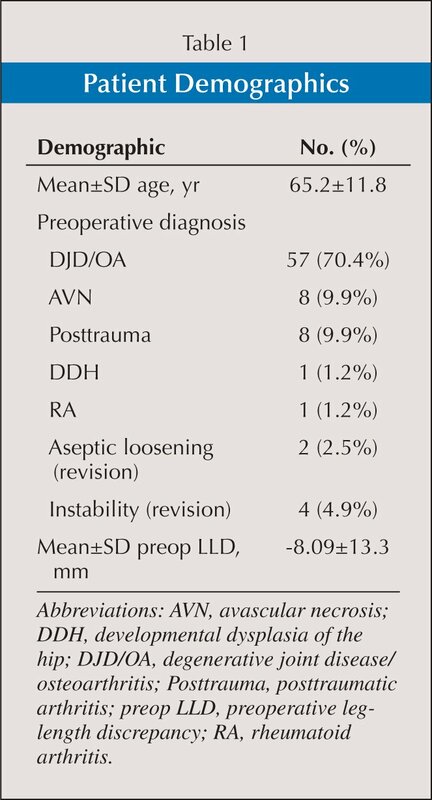 Regarding the primary objective of the study, the intraoperative method most highly correlated with postoperative radiographic LLD was the AS method, with a correlation coefficient of 0.360 (P<.05) for intraoperative measurements (Table 3). This compares to correlation coefficients of 0.275 and 0.301 for TP and PL techniques, respectively (both P>.05) (Tables 4–5). Several secondary research objectives were also evaluated. Comparison of clinical postoperative LLD with radiographic postoperative LLD revealed a weakly positive correlation overall of 0.226 for all 3 methods (P<.05) (Table 6). However, this did not reach statistical significance in subgroup analysis for each method, despite similarly weak positive correlation coefficients (0.157 for AS, 0.394 for TP, and 0.224 for PL) (Tables 3–5). Despite the highest correlation between intraoperative LLD and postoperative radiographic LLD, the AS method demonstrated the poorest correlation with clinical LLD (R=0.462), albeit significantly correlated (P<.01) (Table 3). Correlation with clinical LLD was moderately positive for TP (R=0.596) and PL (R=0.549) methods, respectively (both P<.01) (Tables 4–5). Another analysis was conducted comparing intraoperative measurement and postoperative radiographic LLD. For all methods, intraoperative measurements were weakly correlated (R=0.306; P<.01) (Table 6) to postoperative radiographic LLD. Multivariate logistic regression revealed no significant association with age (P=.146), preoperative diagnosis (P=.658), or type of procedure (primary vs revision; P=.186) on the degree of correlation between intraoperative measurement and postoperative radiographic measurement. The volume of THA procedures performed annually is climbing as rapidly as patients’ expectations for implant survival and postoperative satisfaction, and therefore precision in technical proficiency is paramount.31 Limb-length discrepancy is a common concern for both surgeon and patient in the setting of THA. There is a paucity of published literature demonstrating an optimal method for intraoperative assessment of LLD and preventing clinically apparent postoperative LLD. Identifying intraoperative methods that minimize the incidence of clinically apparent postoperative LLD may improve long-term patient outcomes. This study aimed to answer several questions. Primarily, the authors’ analysis revealed, overall, a mildly positive yet statistically significant correlation between the intraoperative assessment of LLD and the final resulting postoperative radiographic LLD. 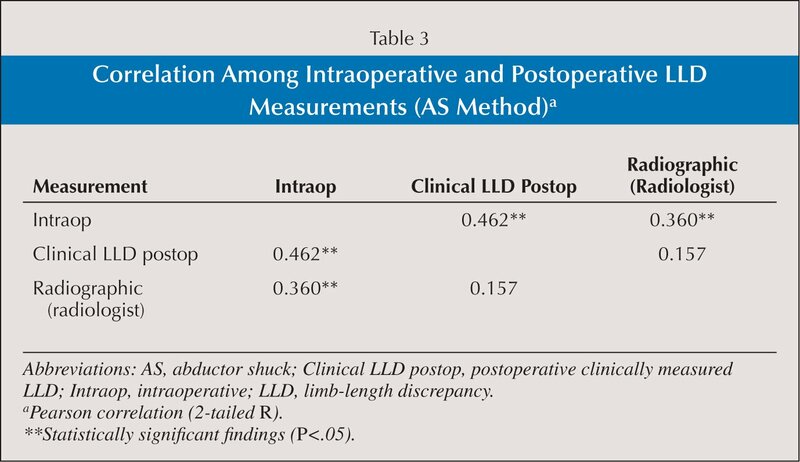 This positive correlation underlies the fact that intraoperative measurements of LLD were, on average, within 7 mm of the final postoperative LLD. Clinically, this constitutes an acceptably close correlation in achieving equal leg length for patients after THA based on previous studies. Subgroup analysis of the correlation between each intraoperative method and final postoperative radiographic LLD revealed the AS method to be the most highly correlated. This method incorporates a length measurement of both longitudinal and horizontal (offset) changes. The TP method, in contrast, uses parallel pins and bubble level to ensure a more accurate measurement of longitudinal change in length without incorporating offset changes. The method also featured arguably the most objective protocol, with use of a calibrated caliper. 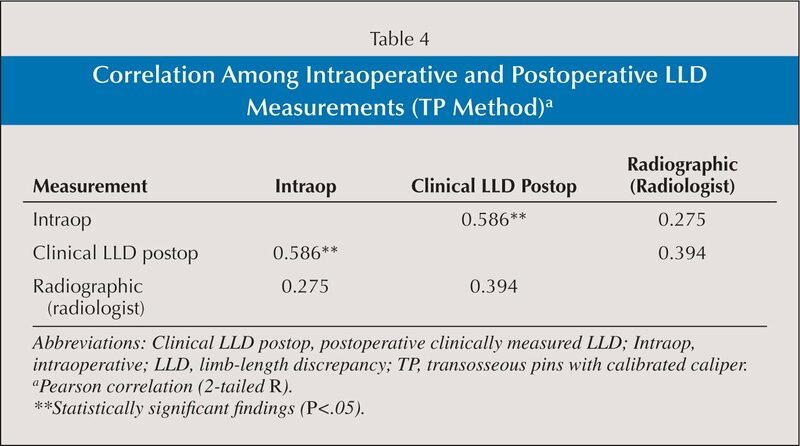 This reproducibility was reflected in the high correlation between intraoperative measurements for the TP method, but failed to translate into high correlation with postoperative LLD. Whether the caliper used with the TP method possessed inherent design shortcomings that limited precision or faltered due to operator error could not be determined. Nonetheless, surgeons treating the cases at the authors’ institution had used the caliper system prior to this study and felt comfortable with its use. All attending surgeons in the study had routinely performed THA (20+ annually per surgeon) for at least 7 years. Further expertise needed to use the instrument may preclude its utility for the general orthopedic community. The AS method demonstrated the worst correlation with clinical LLD, with moderately positive correlation in the other 2 methods. The significance of this finding may be that clinical measurement of LLD is an unreliable benchmark for comparisons in leg length, as clinical LLD correlated poorly with radiographic LLD. The authors conclude that clinical measurement of LLD should not be used as the sole method for preoperative and postoperative comparisons, but rather should only be used as a supplement to radiographic calculation. One of the strengths of the current study is its objective final determination of leg-length discrepancy. To ensure a completely blinded, unbiased radiographic assessment of postoperative LLD, board-certified radiologists performed the radiographic analysis. This study had several limitations. Although overall analysis revealed statistical significance in correlation analysis, subgroup analysis failed to demonstrate statistical significance but may have with a larger number of patients. Therefore, a small study population is a limitation. This study focused on the ability to reliably predict postoperative LLD based on intraoperative methods and thereby afford the surgeon an opportunity to take additional measures to ensure equal or nearly equal leg lengths postoperatively. This study did not include a postoperative functional analysis, and no long-term results are available for these patients. However, a multitude of previous studies have established numerical thresholds for clinically meaningful LLD, and the clinical outcomes that result in THA patients with and without significant LLD are well documented in previous literature. The 3 methods used in this study included the 3 primary methods used at the authors’ institution. These may not be methods used at other institutions. Therefore, broad relevance may be limited. Similarly, the intraoperative methods used were employed through an anterolateral Watson-Jones approach to the hip, and are either irrelevant or impossible to perform via other common approaches. Therefore, these methods may not benefit surgeons and patients at institutions that do not use the anterolateral approach. Using a greater variety of intraoperative measurement techniques through a larger number of approaches serves as fertile ground for future research. The current study’s population included 6 patients undergoing revision THA, which may have factors affecting leg-length discrepancy distinct and different from those of primary THA. Nonetheless, achieving equal postoperative leg length is a major goal of each procedure, and the 3 intraoperative methods have the same ease of use in each procedure. Additionally, a multivariate analysis comparing primary THA and revision THA revealed no significant effect on the correlation between intraoperative measurements and postoperative LLD. Intraoperative assessment of LLD correlates positively with postoperative LLD in THA, and is therefore a useful adjunct in preventing clinically apparent postoperative LLD. However, weak correlation serves as a caution to surgeons against over-relying on particular methods and neglecting fundamental surgical principles. In the current study, an abductor shuck method was most significantly correlated with postoperative radiographic LLD that resulted in average LLD well below the accepted threshold for clinically apparent complications. The method is quick, inexpensive, and easy to use for surgeons employing an anterolateral approach to the hip. Intraoperative LLD is positively correlated with postoperative LLD. Clinical measurements of LLD correlate poorly with radiographic measurements and may be of limited utility. Further study is warranted in identifying useful, precise, and cost-effective intraoperative measurement techniques for common approaches in THA. Gordon AC, D’Lima DD, Colwell CW Jr, . Highly cross-linked polyethylene in total hip arthroplasty. J Am Acad Orthop Surg. 2006; 14:511–523. Clark CR, Huddleston HD, Schoch EP III, Thomas BJ. Leg-length discrepancy after total hip arthroplasty. J Am Acad Orthop Surg. 2006; 14:38–45. Williamson J, Reckling F. Limb length discrepancy and related problems following total hip joint replacement. Clin Orthop Relat Res. 1978; 134:135–138. Edeen J, Sharkey PF, Alexander AH. Clinical significance of leg-length inequality after total hip arthroplasty. Am J Orthop (Belle Mead NJ). 1995; 24:347–351. Edwards BN, Tulles HS, Noble PC. 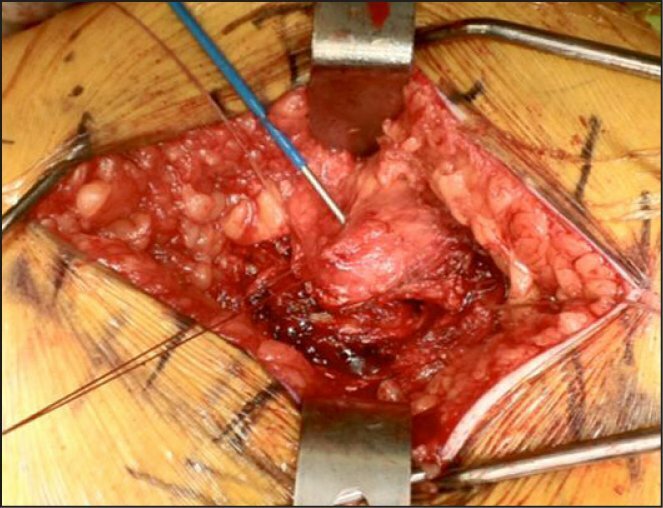 Contributory factors and etiology of sciatic nerve palsy in total hip arthroplasty. Clin Orthop Relat Res. 1987; 218:136–141. Gurney B, Mermier C, Robergs R, Gibson A, Rivero D. Effects of limb-length discrepancy on gait economy and lower-extremity muscle activity in older adults. J Bone Joint Surg Am. 2001; 83:907–915. Mihalko WM, Phillips MJ, Krackow KA. Acute sciatic and femoral neuritis following total hip arthroplasty: a case report. J Bone Joint Surg Am. 2001; 83:589–592. Jasty M, Webster W, Harris W. Management of limb length inequality during total hip replacement. Clin Orthop Relat Res. 1996; (333):165–171. Parvizi J, Sharkey PF, Bissett GA, Rothman RH, Hozack WJ. Surgical treatment of limb-length discrepancy following total hip arthroplasty. J Bone Joint Surg Am. 2003; 85:2310–2317. Bose WJ. Accurate limb-length equalization during total hip arthroplasty. Orthopedics. 2000; 23:433–436. Hofmann AA, Bolognesi M, Lahav A, Kurtin S. Minimizing leg length inequality in total hip arthroplasty: use of preoperative templating and an intraoperative x-ray. Am J Orthop (Belle Mead NJ). 2008; 37:18–23. Iagulli ND, Mallory TH, Berend KR, et al. A simple and accurate method for determining leg length in primary total hip arthroplasty. Am J Orthop (Belle Mead NJ). 2006; 35:455–457. Knight WE. Accurate determination of leg lengths during total hip replacement. Clin Orthop Relat Res. 1977; (123):27–28. Noble PC, Sugano N, Johnston JD, et al. Computer simulation: how can it help the surgeon optimize implant position?Clin Orthop Relat Res. 2003; (417):242–252. Woolson ST, Harris WH. A method of intraoperative limb length measurement in total hip arthroplasty. Clin Orthop Relat Res. 1985; (194):207–210. McGee HM, Scott JH. A simple method of obtaining equal leg length in total hip arthroplasty. Clin Orthop Relat Res. 1985; (194):269–270. Colton T. Statistics in Medicine. Boston, MA: Little, Brown and Company; 1974.